First and foremost, ask yourself why you want to increase your credit limit. If it’s to go on a shopping spree or purchase things you can’t afford without credit, stop right there. You’ll need to have proven to yourself and the bank that you know how to use credit responsibly in order for them to approve you. This means that you’ve exemplified yourself as a good customer for at least 6 months. If your cards are maxed out, you’ve been late making payments, or you’ve even missed payments, your chances of approval are slim to none. Sometimes, applying for a new card altogether is the simplest option, as each individual card can have its own credit limit cap depending on its target demographic. 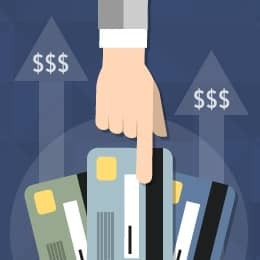 You can choose a credit card company, apply, get your new card and be done — or you can apply for a new card with your current lender and, once approved, reallocate a portion of your new credit line to the card you originally wanted to be increased. Yes, you can do this, assuming you have better-than-average credit, and it can get you significantly more than you originally requested. 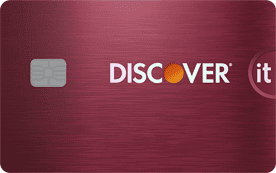 Here are our best overall offers with generous credit limits upon approval. Pick a card in your wallet you want to have the limit increased on. Don’t assume if you ask all of your credit issuers that your chances of being approved are greater. Choose one card to request an increase on. When you request an increase, the issuer will need to pull your credit history to see if you’re creditworthy. This credit pull will be noted on your credit report and will slightly lower your credit score. If multiple issuers are pulling your report, it won’t be so slight. Not only that, the issuers will be able to see that other issuers are reviewing you as well, meaning you’ll come across as desperate for money. This is a red flag in the eyes of credit companies and can easily hurt your chances for approval. If you call the credit issuer crying that you have an emergency and think your sob story will make them empathize with your situation and increase your credit limit — think again. And remember, being kind to the person on the other end of the phone can also help — they’re just doing their job, so don’t take your financial frustration out on them. Not only will being rude be unlikely to help your case, but yelling or cursing at a representative can give them the right to hang up on you, guilt free. Asking for too much of an increase can be seen as yet another red flag, which may cause you to be denied and you’ll have to wait a few more months to reapply. Expect an increase of 10-25 percent. Don’t ask the representative how much you should request, either. Credit card companies prohibit their employees from providing this advice to you. 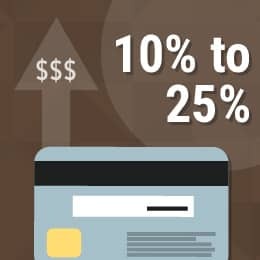 There’s a not-so set-in-stone standard that says 10 to 25 percent is a good percentage to aim for, so if you have a $1,000 limit, expect to see up to an additional $250 or so made available to you. This is not a hard and fast rule, however — those with good credit histories can receive substantially more and every situation is different. If you do receive considerably more, don’t let the new credit limit entice you into overspending. Banks love balance transfers like Joanie loves Chachi. If you don’t know how balance transfers work, all it means is you’re transferring your balance from one credit card to another. These can be a pretty sweet deal, as many credit issuers nowadays offer zero percent interest on transfers for up to a year or longer. That means you stop paying interest for that time period if you move your balance from Card A to Card B. It’s actually a pretty smart move, financially speaking. This can save you hundreds of dollars. A balance transfer fee. Check if there is one and the amount to see if it’s worth it. If the fee equals the same amount you’d save, it’s not such a sweet deal after all. If you don’t pay the amount in full by the time the no-interest period is over, the new issuer gets to make the money from the interest they’re now charging you that would have gone to your previous issuer. If you tell your issuer you want an increase so you can transfer your balance, they’ll likely want to make this work, assuming they can trust you to make the payments (i.e., having a decent credit history). Credit issuers review accounts generally every six months, and those in good standings will naturally receive limit hikes periodically. Continue to be a good customer by always making payments on time, and if you can swing it, pay the balance in full each month. Be patient, grasshopper — good things come to those who wait! You’re now prepared to request the credit limit increase you’ve earned by being a responsible consumer. Understand that a higher limit can easily tempt you to charge more and lead you down a dangerous road. Don’t change your spending habits on a false sense of increased wealth. Continue to use credit for emergencies only, or if you know you can pay the balance in full each month, and always keep your credit utilization ratio under 30 percent.